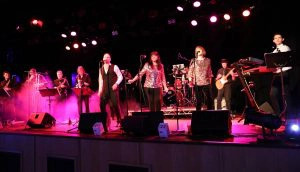 We act as an agent for a wide variety of high quality groups and solo musicians which can be booked either on their own or alongside any of our other services. These range from high energy function bands to acoustic acts, string quartets, jazz groups, pianists, solo entertainers and more. Booking a package with, for example, one of our DJs means you’ll have just one contact to liaise with for all the entertainment and a single round figure for your accounts. Please get in touch to see our roster and hear samples. Ideal for a picture slideshow at weddings or for meetings and conferences! Media can be played directly from a USB stick or from a laptop and is displayed on a large pull-up screen. Do you have a guitarist performing and need a sound system so they can be heard? Need a wireless microphone for your wedding speeches? 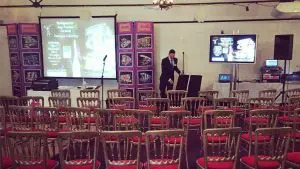 We can supply anything from a DIY package of a speaker on a stand for ceremony music to a full production package for a live band with lighting and a sound engineer. Please contact us to discuss your requirements. Highlight special features of your venue in colour with our mood lights. If you require anything for your event that you haven’t found on this page, please just ask and we will try our best to make it happen!